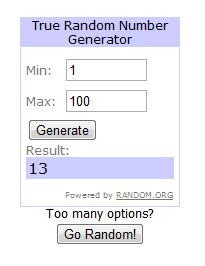 The winner of the Simple Mom book 'Organised Simplicity' is comment 13, Anne from domesblissity! Congrats Anne, If you could email me with your address details I will send it out to you as soon as possible! OMG Tammy! Are you serious? Thank you so very, very much! I've never won anything in my life and I don't know how many giveaways I've entered. You've really made my day, week, year!